The nursery with some modern wooden fishies that my husband built and painted himself. I found this company in one of those envelopes full of flyers that come in the mail each week. The flyer I came across had a coupon for $25 off a duct cleaning so I decided to take them up on the offer. The estimate I received over the phone was very close to the final price (I paid a little less in the end) which doesn't always happen. The duct cleaner arrived on-time and finished the job in about an hour (he removed between 2-3 lbs of dust). He did try to upsell me on an electronic HEPA filter but didn't push it when I politely declined. Overall, I'd gladly use them again. To really make a statement in our front foyer, we purchased a tumbled marble mosaic from Antica and had it professionally installed. The salesperson we dealt with was friendly and was able to recommend a travertine tile and grout colour to match the mosaic we chose. Compared to other places I've been to, the tile selection at Antica is limited and the prices are often higher. Mosaics however are hard to find and this is something that Antica does quite well. The Olympia Tile Clearance Center is easily one of the best kept renovation secrets in Toronto. It's located directly across the street from Olympic Tile in the Dufferin & Lawrence area. The selection at the clearance center is limited compared to the main showroom, but the prices are deeply discounted (we bought glass mosaic tile for our bathroom at $1.49/sq. ft.). All tiles can be bought and taken home on the spot. The clearance center carries porcelain, glass, marble, travertine tile etc., a couple of different tile cutters if you're looking for them, plus mortar and adhesive. They're easily a one-stop shop if you're looking to DIY. When I signed-up with ADT October 2007, the Sales Representative they sent out showed up over 3 hours late to our initial consultation. This first contact with ADT should have been an indication of the level of professionalism and customer service I would receive from the company in the months to follow. Despite this first impression however, I signed up with ADT based on their reputation as "the leading home security company in North America." From the moment I became a client, I have received frustrating customer service, experienced multiple time consuming installation visits (totalling well over 30 hours in a fully gutted house), and have been given unsatisfactory responses to my account inquiries. To date, I have been in contact with my Sales Representative, her boss and the ADT local office on numerous occassions as a few of the hardware items I purchased and had installed were faulty and had to be removed. Getting money back from ADT is near impossible as they cannot credit your account but rather need to send you a cheque in the mail. I've now been waiting for a cheque for nearly 2 months. For anyone thinking of using ADT, all I can say is STAY AWAY! After a long winter and a wet spring, the area in front of our house was a wreck. We found ourselves parking on a muddy concrete space and finally had enough. We called Roberts and they suggested a beautiful tumbled stone which was installed in a mere 2 days. The team was fast and Robert was in constant contact with me from estimate through to job completion. Needless to say, we're very pleased. One night while in bed we heard little footsteps above us and immediately thought we had rats. After calling Cain and having an attic inspection done, we found out that it was actually squirrels that were getting into our attic through a hole in the side of our house. Cain was very quick to respond to our issue (we called Friday evening and they were onsite Sunday at noon) and were even able to fix the problem on the spot. I'd highly recommend them for any of your pest control needs. Before we had the UV pigeon guard net installed, we tried tying an owl to the balcony railing and spraying the rails with lysol. Both worked for a short period of time, but neither for the long-term. Our pigeon problem eventually got so bad that we couldn't enjoy our space as it was over run with hazardous droppings. Then the unthinkable happened, the pigeons laid eggs! 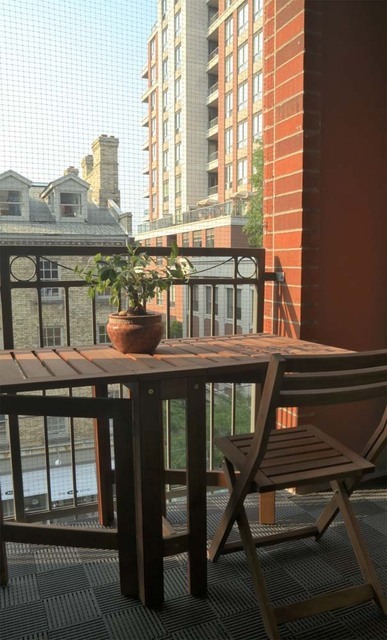 Once the eggs hatched in the Spring and the birds flew away, we immediately cleaned-up and disposed of the droppings and the nest, disposed of our balcony furniture and called pigeon guard to install the custom netting and solve our problem for good. The pigeon guard team was prompt, reasonably priced, and the job was done in less than two hours. The net itself is near invisible so it's both functional and fits in easily with any decor. Thanks again! Working with Roberts was a dream! They were very fast, always kept us up to date on the progess of our job and even took photos for us along the way. They worked clean, were professional and very courteous to our neighbors, had lots of experience with old Toronto homes and were reasonably priced. I'd highly recommend them! We went to Home Depot with the simple question of 'how do we remove ivy from the side of our house?' Not only did the garden department know the answer but they walked with us around the store to equip us with everything we needed for our DIY weekend project! It was inexpensive but lots of hard work. Our advice is to hire some teens in the neighbourhood to help! Joe was a fantastic repairman. He was able to identify the problem quickly and had the right tools in hand to fix it in the same visit. His paging service made him very easy to reach, even on a Sunday! He was quick, reliable and relatively inexpensive. I'll definitely call him again! In our condo we have three large windows to cover, one of which is a door leading out to our balcony. To do this we decided to purchase sheer Levolor blinds from the Home Depot. The price-value on this order was ok and generally comparable to others but on the slightly higher end, our ordering experience however was below par. The in-store service was slow, the order was delayed and when it arrived the measurements were slightly off which necessitated sending them back for re-cutting. In the end the project turned out fine, but the process itself was painful. As first-time homeowners, we wanted the granite look without the granite price. To achieve this we opted for Formica countertops that we ordered through the Home Depot. The in-store staff was friendly and made the ordering process an absolute breeze! 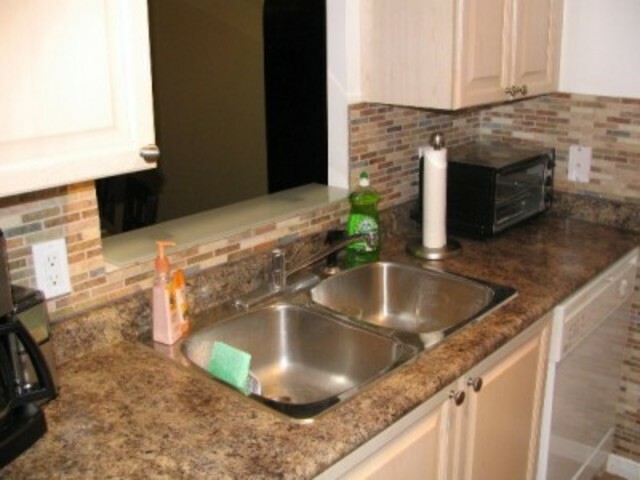 When the countertops arrived, they looked great and were installed without any problems. A little over two years later I still feel like we made the right decision and the countertops continue to look as good as new! I highly recommend this option for anyone renovating on a budget.